This is one of the best red hair color ideas for brunettes. Black cherry hair color pairs well as an accent color for with women who have dark brown to black hair. Black cherry is a dark, muted, and rich shade of red that is sure to turn heads without going overboard. 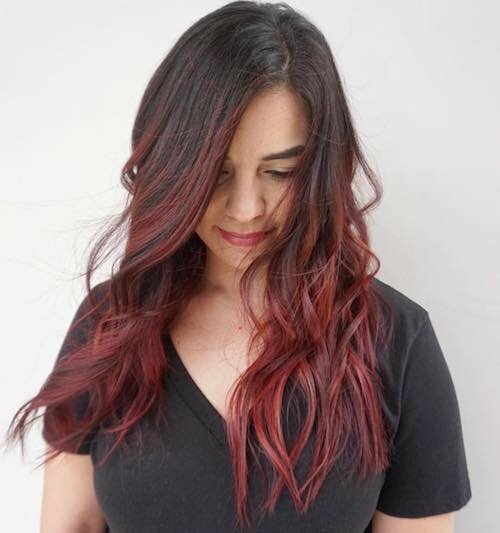 If you’re looking to make an impact with red hair color, but want to keep things professional, then take a look at these black cherry examples. 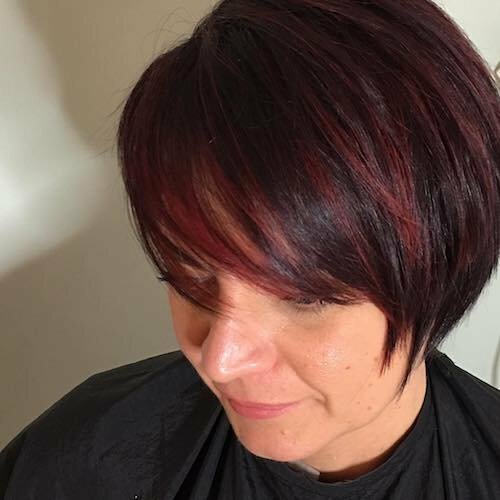 Here’s a black cherry hair color on a short feather cut hairstyle. It’s a subtle shade of black cherry that blends into the darker hair base. 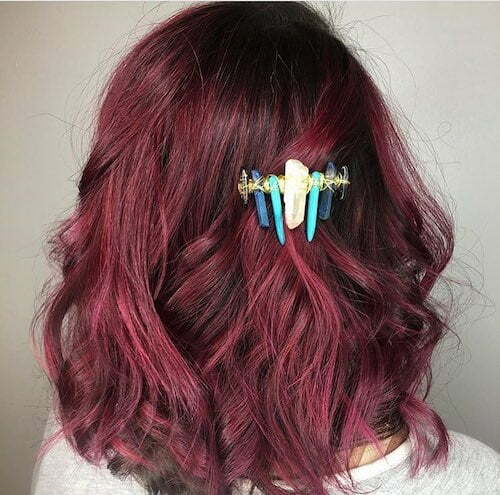 Black cherry hair dye on a short wavy hairstyle. A lapis and turquoise stone hair comb accents the hair color. 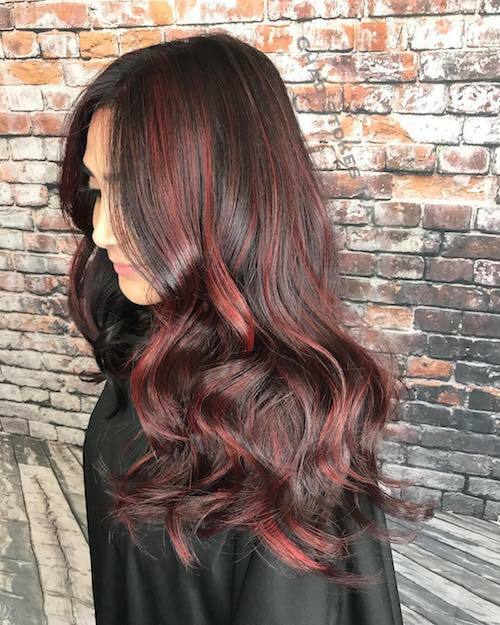 For the best red highlights on black hair, see this luxurious black cherry hair color over black hair for long luscious locks. 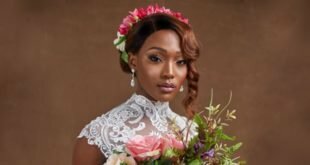 Bring elegance and grace to your next special occasion with this fabulous look. 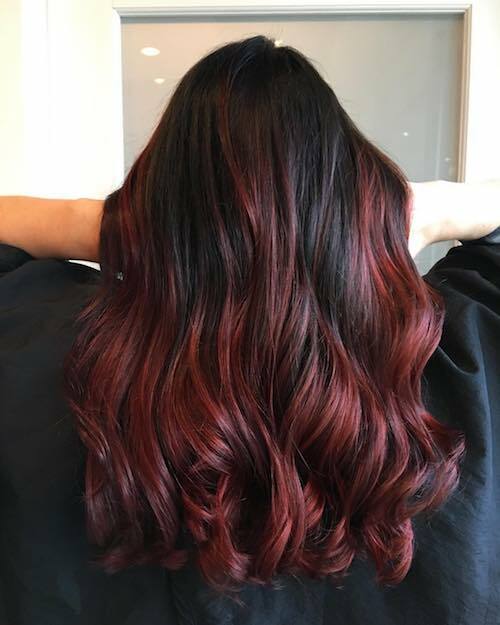 A black cherry balayage on dark brown hair with a long wavy hairstyle. This gently infused color pop is conservative enough to be your everyday look at school or the office. A long black cherry hairstyle for Asian women with dark hair. The dark and cool black cherry shade perfectly complements her skin tone. Burgundy hair color is a dark red-brown-purple shade of red that evokes the essence of a fine French Burgundy wine. But, you don’t have to be a wine drinker to appreciate the richness and vibrancy of burgundy hair. If pure red is too too harsh for you, but you still want to stand out from the crowd. 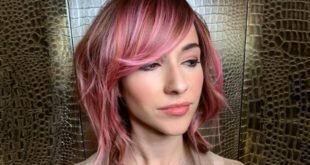 Take a peek at burgundy hair color and see if that matches your style. 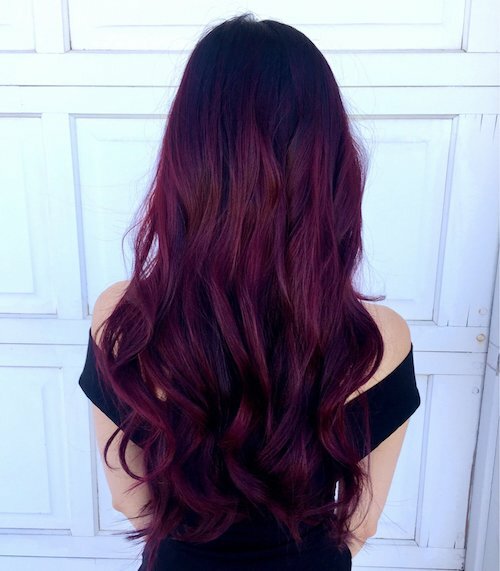 Bordering on purple tones, this burgundy balayage hairstyle for long hair looks amazing. 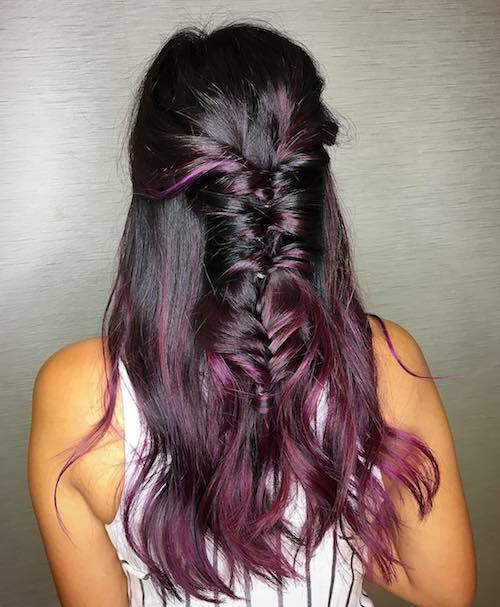 The braid work takes this burgundy hair color and hair style to a new height in drama. A two-tone burgundy hair color with a hint of cranberry in a curled medium length hairstyle for fair skin tone. The elegant burgundy color complements blue-gray eyes to exude sophistication and style. 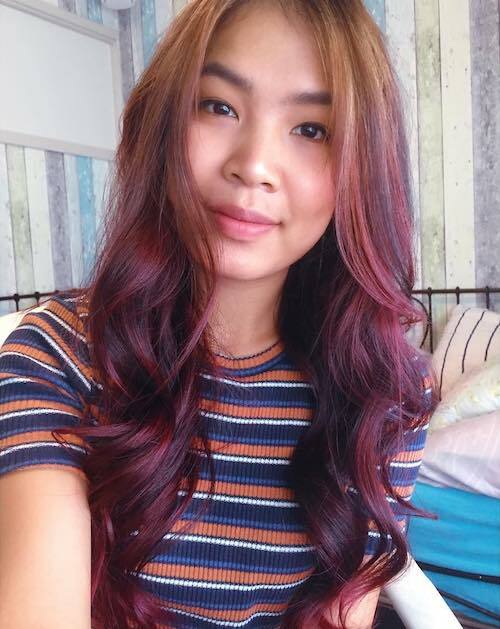 This burgundy balayage for Asian women with light brown hair is a cascade of color tones creating a waterfall effect. 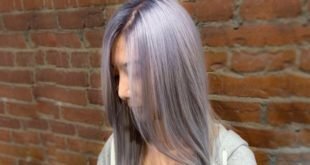 This hairstyle is a fanciful, casual, yet elegant look for Asian skin tone. 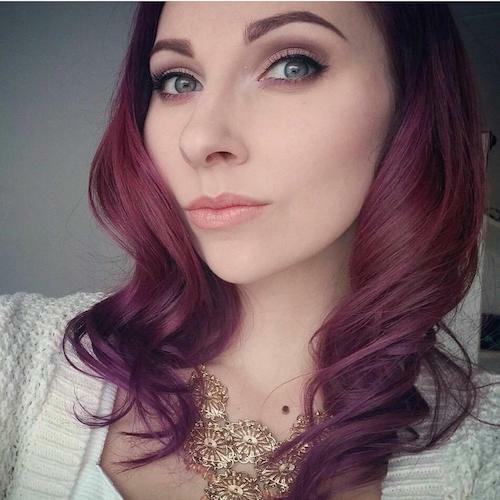 Burgundy hair color includes various shades of burgundy. A merlot hair color for long straight hairstyle is a lighter, redder tone in the burgundy wine color palette. 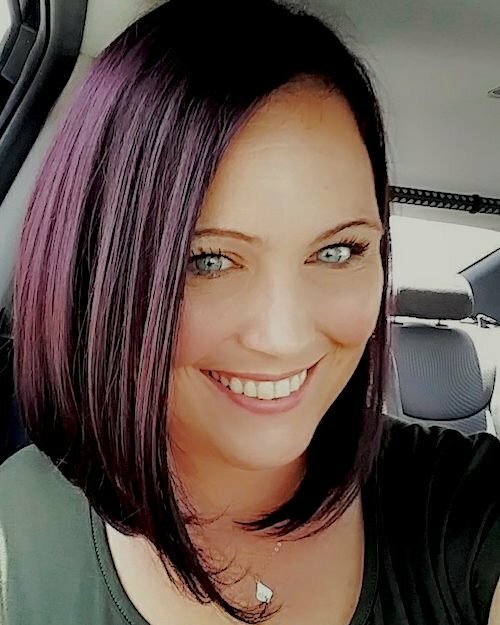 A short straight hairstyle with a burgundy hair color. It’s a flattering shade of burgundy hair color for women with fair skin and light-colored eyes. 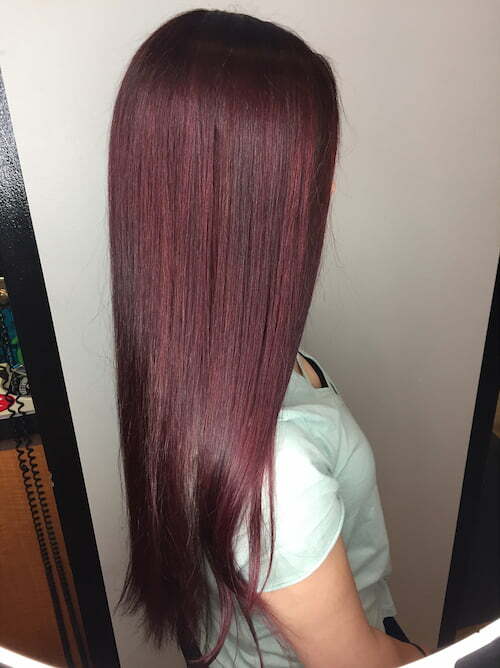 A deep cabernet hair color balayage over a burgundy base achieves a glowing effect. The subtle color changes between the burgundy and the deep, redder, cabernet gives a rich and luxurious look. When kissed by fire translates to flame colored hair, it’s time to turn up the heat. 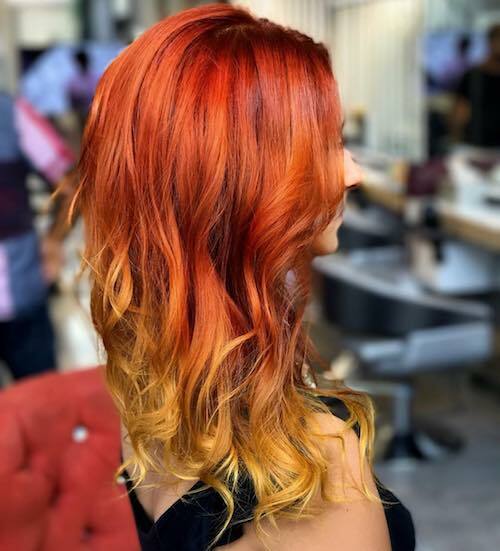 Creating the essence of fire using red, orange, and yellow hair dyes will transform you into the hottest person in the room. 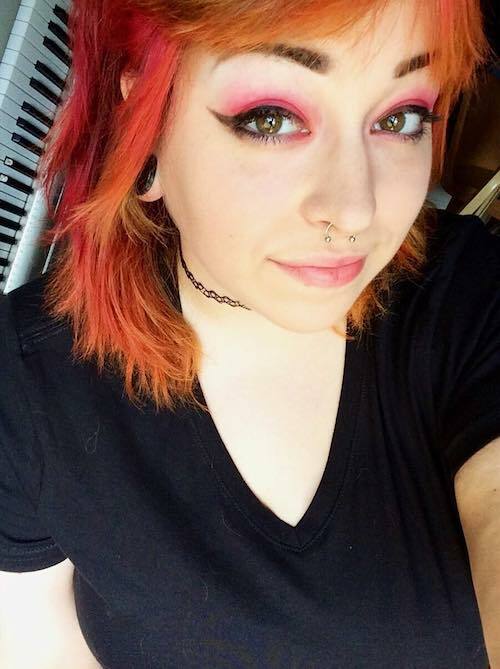 The only question is, can you stand the head from this fiery, attention-grabbing hairstyle, or will you withdraw and get out of the kitchen? 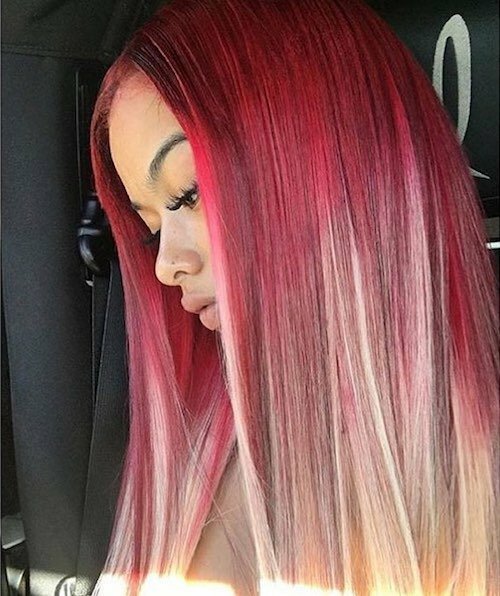 You’ll want to rev up your engines when sporting this fire hair color. Like those flaming hot rod muscle cars from the past, you’ll be racing down the highway before you know it. Just watch out for speed traps! 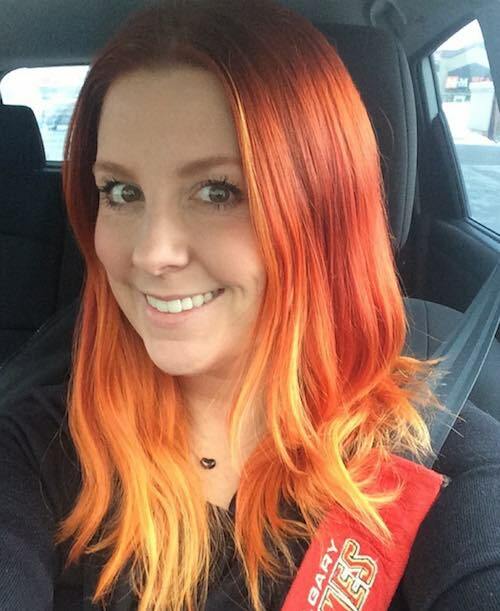 Love the idea of flaming hair color but have a real job that cramps your style? 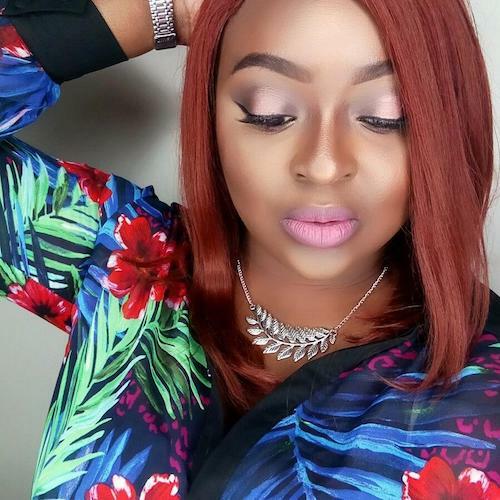 Check this red peekaboo fire hairstyle that lets you be conservative when you must. After your shift is done, let your hair down and your blazing personality peek through. 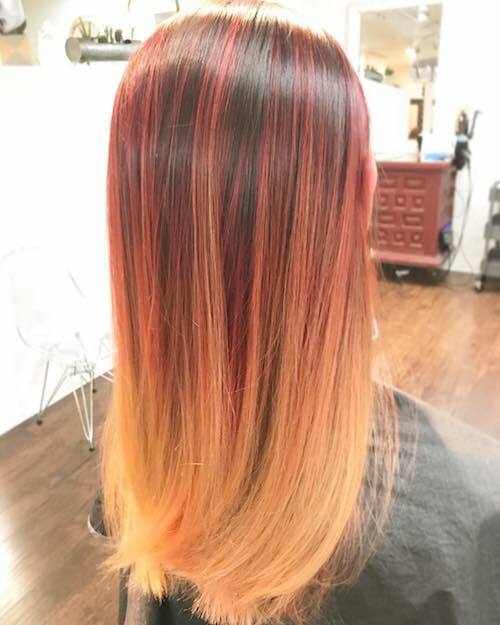 Who says flaming hair color can’t be stylish? Dip your ginger based fine hair into golden blonde ombre for a smooth yet striking transition. 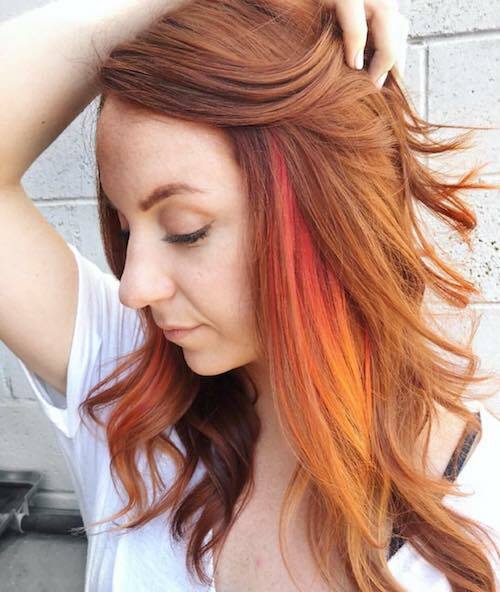 A muted fire color hairstyle radiates a dramatic blaze minus the harshness of a brighter flame. 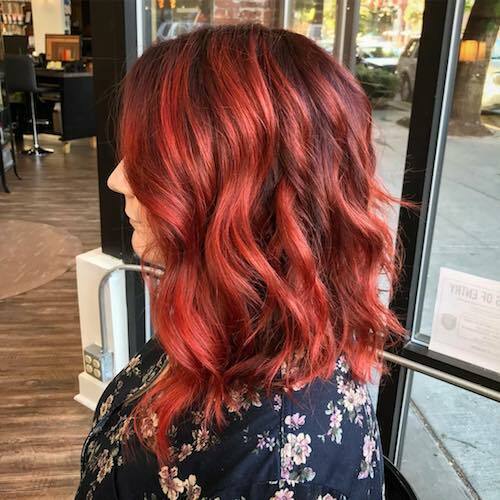 For short, thick hair, a fire hair color is a hot way to add fun to your hairstyle. Complement your glowing hair with bright magenta eye shadow and prepare yourself for all the smiles. Vermillion red, also called vermilion red, is a medium bright red shade of fire. Look to this ancient cinnabar red color inspiration when seeking a muted fire that attracts attention, but won’t glow in the dark. This red hue works will fair skin tones as well as dark skin tones. 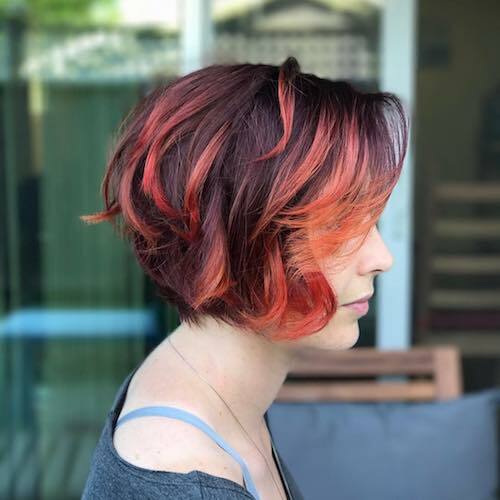 Vermillion red hair highlights on a bob hairstyle with a dark brown base suggests a smoldering fire with licks of flames. A vermillion red hair color on thick, medium hair with twirled curls. 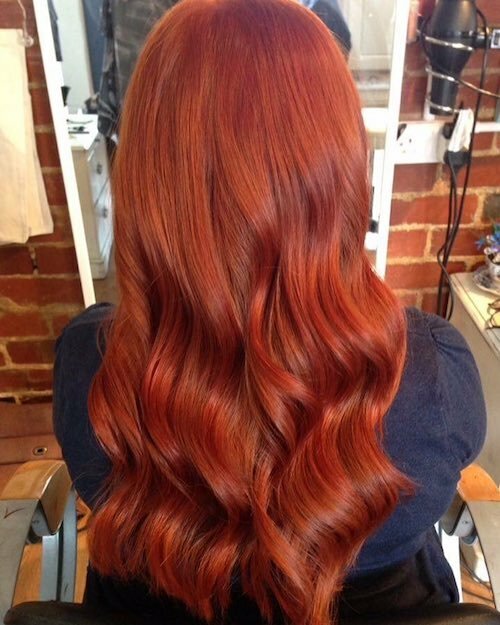 Here’s a solid vermillion red hair color for long wavy hair. 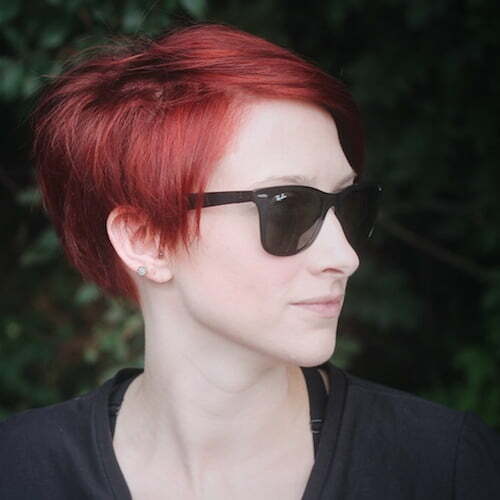 A vermillion red pixie for fair skin tone. Escape a typical ginger hair color for fair skin combination with a shift to vermilion. This red hue adds a level of sophistication to your red hair color and will still turn heads. This vermillion red hair color for dark skin shows the versatility of this shade of red. The medium, muted tones of this vermilion color complements all skin tones. 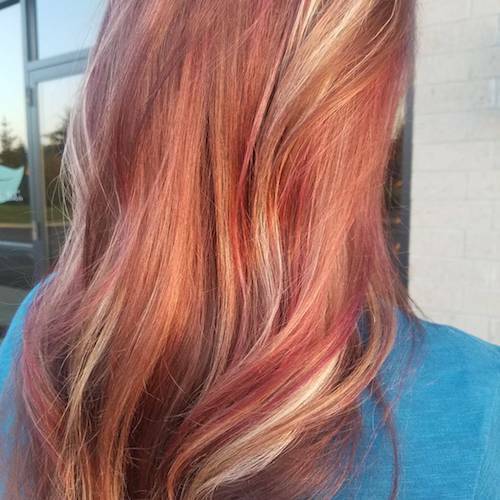 Fine blonde hair infused with red hair color balayage for a soft and gentle touch. Look lusciously feminine with a red twist to showcase your own personality. Add a little red hair color drama to your sun-kissed blonde locks with this peek-a-boo dip for medium length hair. Show others that underneath your business-first outward appearance lies a red-hot fire waiting to burst through. When you want all the attention, consider a bright apple red hair color with a blonde ombre for Asian skin tones. This color duo for long straight hair is sure to turn heads where ever you go. Add some pop to your medium length blonde hair with side swept bangs by adding deep red highlights. 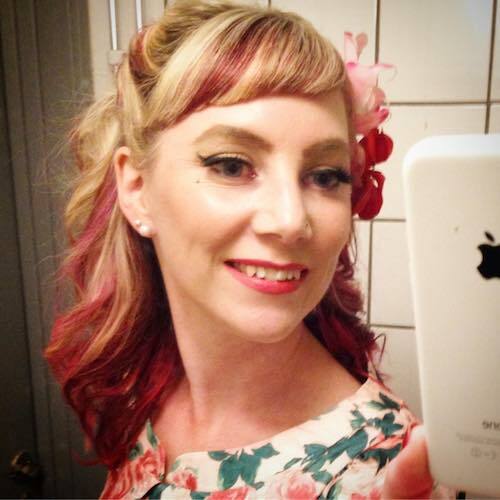 Top with a matching flower hairpin to complete this modern version of a retro-vintage look. 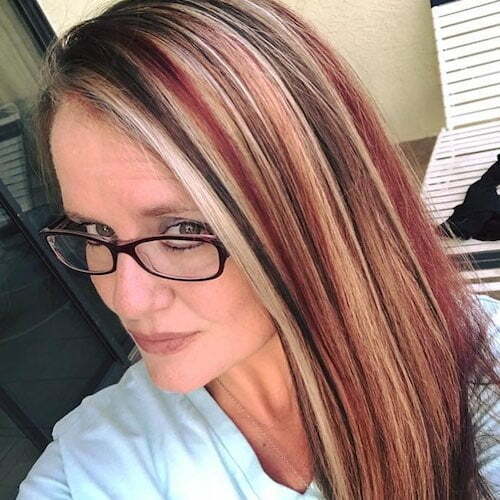 Color your long dark brown hair with blonde and cranberry hair color chunks for an exotic striped hairstyle. When you’re feeling kissed by fire but can’t stomach bold yellow and red flames, tone it down for a classier appearance. 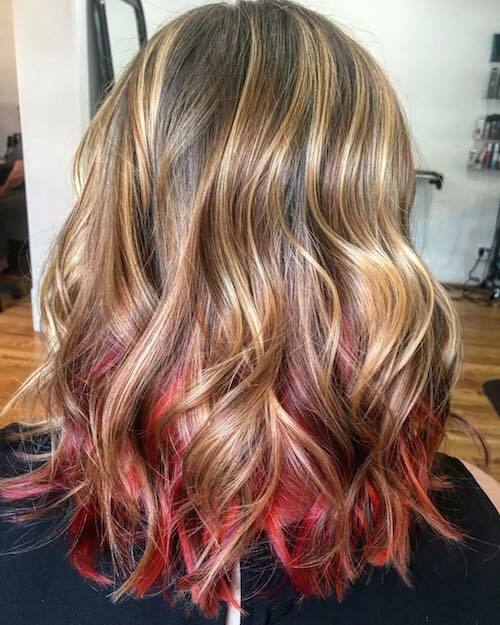 Begin with a light cherry red balayage and blend to a blonde ombre keeping the color tones subtle and muted. The result is a fire hair color thats big enough to get looks without the laughs. The next time you’re going out on the town, add a blonde overlay to your raspberry red hair color for long fine hair. The blonde streaks add an amazing splash and a sense of wildness to your look. That’s the list of red hair color ideas for now. We will be updating this post periodically as we find new trending styles for you. Let us know which was your favorite shade of red, and let us know if you have other ideas and colors to share with us in the comment box below. Thank you! I always wanted to have red hair but not enough courage.